MacTalk - The iPad that still won't die: iOS 9 on the iPad 2. In 2012, people started saying that iOS 6 would be the iPad 2’s last update. Then people were convinced iOS 7 was the last update. Almost everyone was convicted that the iPad 2 would never see the light of iOS 9, but again how wrong they were. The iPad 2 has received the most number of major iOS updates out of any Apple device. It started with iOS 4, then got iOS 5,6,7,8 and now 9 - that is 5 major upgrades, compared to the original iPad, which received 2 major upgrades. So onto the main point of the article. Is iOS 9 worth it on the iPad 2? There is now an option to enable an iCloud Drive app on the home screen that actually allows you to manage your files. The iPad 2 receives the ‘Keyboard cursor touchpad’ which allows you to move the text selection cursor around, by using two fingers. The new keyboard also features shortcuts on the top right and left. The iPad 2 also supports the new shortcuts if you connect a bluetooth keyboard. The iPad 2 receives the new notes application, with all the new features such as inserting photos and checklists, but misses out on the sketching function. The iPad 2 can add attachments in mail now. The iPad 2 receives the new iOS font - San Fransisco. It also receives the new look multitasking menu. The iPad 2 supports some of the new spotlight features - mainly deep searching of apps and location based searches. The iPad 2 apparently will run the new news app, but this is not yet included in iOS 9 for Australia. New scrubber bar to scan through photos. iPad Folders now hold 4x4 apps per page, 6 digit passcode, split view control centre, find my friends widget, search in settings, favourites in Maps, public transport (not really working for Australia) and a new open app from other app interface. I installed iOS 8.4.1 and iOS 9 fresh and made sure all apps were set up. I took a few photos, made sure music was set up, signed into iMessage, FaceTime and Mail. 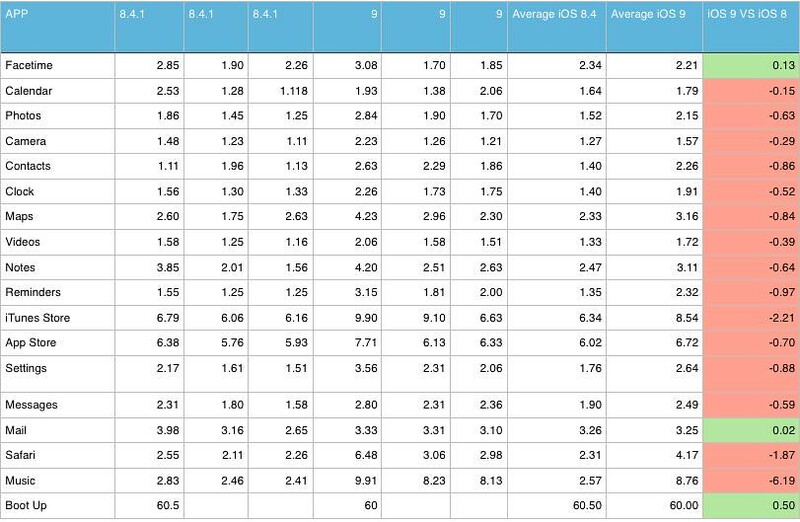 I then launched each app 3 times to get an average, which is to the right of this table. I then took the average of iOS 8.4.1 subtracted the average of iOS 9 to see if there was an increase or decrease in average performance. 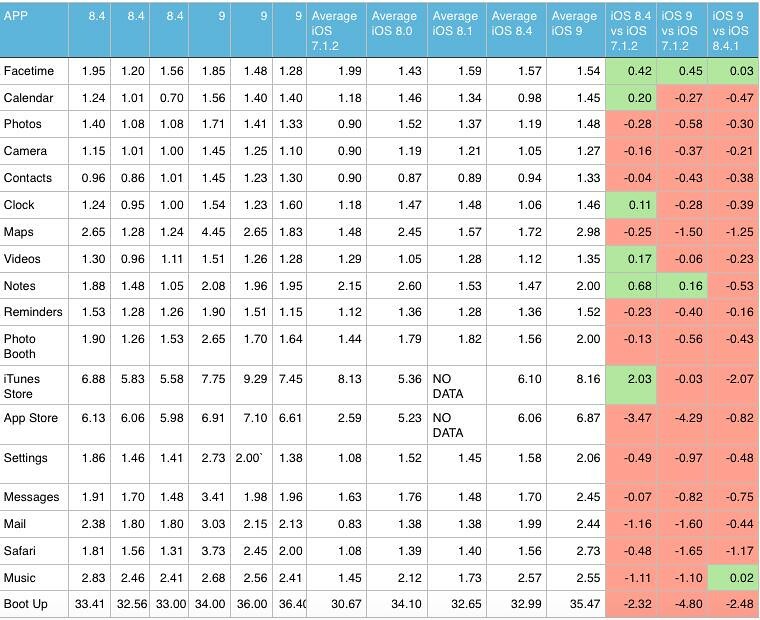 On the table I highlighted the increases as green and the decreases as red. I compared iOS 7 to iOS 8 and iOS 9 to iOS 7 and 8 to give an idea of performance. I can’t rule out human error but I believe these values to be fairly accurate. Except in FaceTime and Music, iOS 9 was slower in pretty much every way. I found the delay when tapping an app quite noticeable. On some apps, such as reminders the difference was very small, but in safari for example it was quite noticeable. I also did a test to see the difference between iOS 8 and 9 on non clean installs, so I restored both from my backup and did a test. Everything on both iOS 8 and iOS 7 was slower on the restored install. However the differences between iOS 8 and 9 were fairly similar to that in the clean install. iOS 9 was definitely slower, and at times noticeably, slow. However the animations particularly for the folders and multitasking seemed to render better on iOS 9 then iOS 8, which did make the experience a little more pleasant. The other thing to note would be that my iPad 2 may have still been indexing when I did the test, so results could be slightly skewed for the restored from backup results. So that leaves the question - should I upgrade? I guess that is up to the individual. iOS 9 seems to be slower on the iPad 2, no matter how you spin it, a little disappointing for a feature light release, that Apple boasted would improve performance. While it is great that Apple supports the iPad 2, the lack of new features does not help justify the loss in performance. Personally I find the speed differences noticeable enough that I’m downgrading to iOS 8. The lack of new features make it very hard for me to justify the speed difference. I am going to wait until Apple starts putting out updates for iOS 9, as they will hopefully address the speed issues. So if you don’t really care about speed, go ahead and upgrade to iOS 9 at your own risk, if not it is probably best to stay with iOS 8 while Apple hopefully fixes iOS 9 bugs and performance issues. Let us know how you go and remember, your experience may vary and neither MacTalk or myself are responsible for any problems or issues you may encounter from updating!